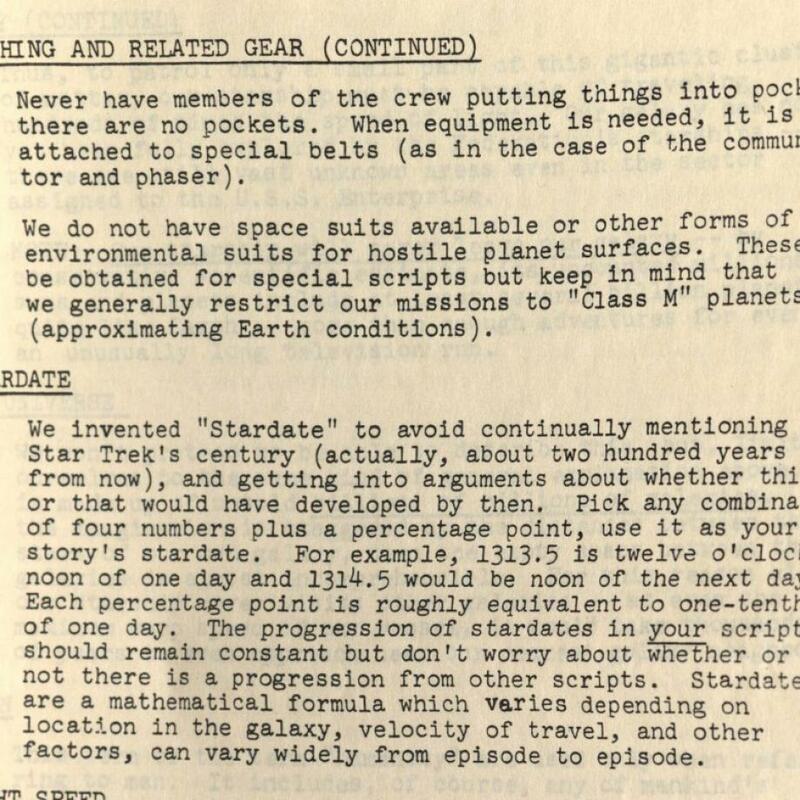 These excerpts from a 31-page photocopied writers’ guide for the original Star Trek series show how early Trek episodes were crafted. 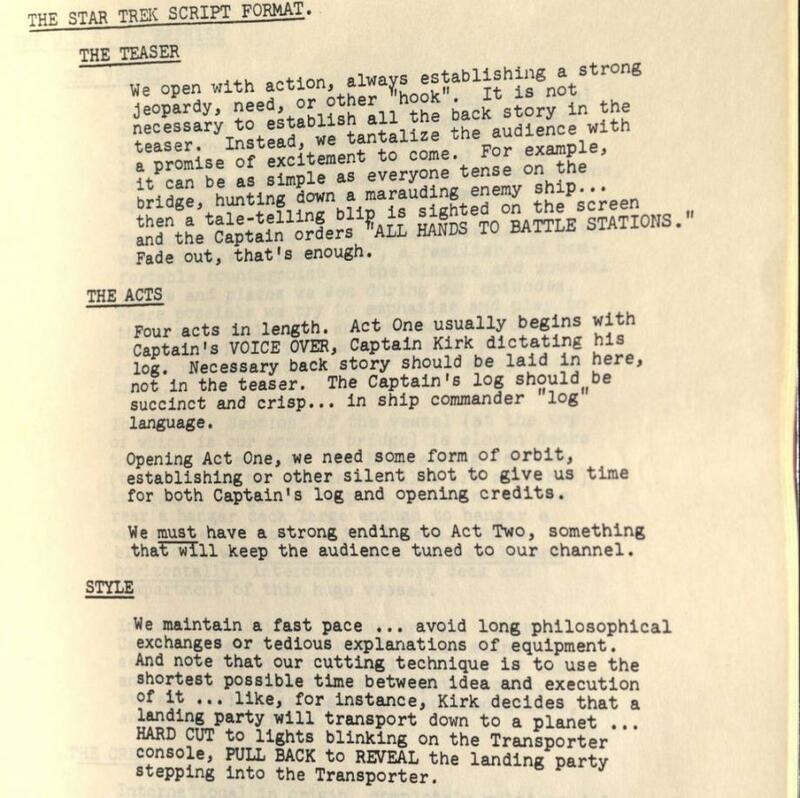 The guide, written in 1967, was meant to help writers for the year-old show—as well as prospective writers working on spec scripts—nail the tone and content of a typical “Trek” episode. The pages list characters and their attributes (Captain Kirk is “a space-age Horatio Hornblower, constantly on trial with himself, a strong, complex personality”), outline dos and don’ts of costuming (no pockets; no space suits), and suggest places where writers working outside the studio can seek technical advice (ask nearby universities, “your local NASA office,” or anyone in the “aero-space research and development industry”). Coming at the tail end of a decade and a half of science fiction television of variable quality, “Star Trek” was eager to establish itself as a new breed of more realistic space opera. 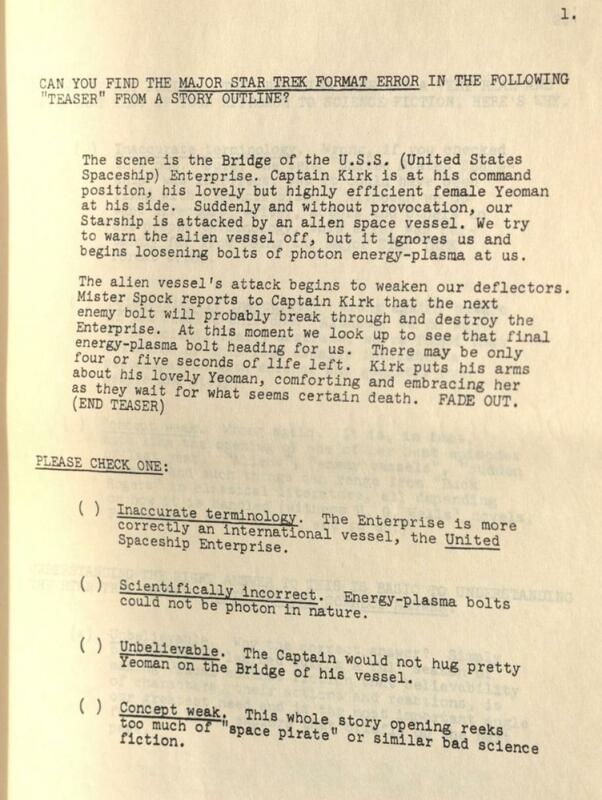 The third page image below describes a scenario in which Captain Kirk comforts a female crewmember as an alien vessel attacks. The guide asks readers to identify the problem with this “teaser.” The answer: “Concept weak. This whole story opening reeks too much of ‘space pirate’ or similar bad science fiction.” Captain Kirk would never hug a fellow crewman as danger approached; he’d be too busy trying to solve the problem. Q: Are you people on LSD? A: We tried, but we couldn’t keep it lit. The entire guide isn’t online; you’ll have to make a pilgrimage to Harvard’s Houghton Library to see it. Thanks to the Houghton Library’s Leslie Morris. Read more in Slate about Star Trek. The Star Trek Guide. 1967. Call number f AC95.A100.967s. Purchased with the Roger Eliot Stoddard Book Fund, 2011. Collection of Houghton Library, Harvard University.